There is no historical or scriptural document that states that Cush left his apportioned land in Africa. Please, note that these were inherited lands from their parents. Secondly, the names Havila, Sheba, Dedan appear in both lineages as a result of intermarriages of Ham and Shem families, and not that they left their ancestral portions. Names usually remained in the same families even to this day especially if it was a woman who went to marry. Now, if you are deciding on the location of the Garden of Eden, then Cush referred to in Genesis, is in Africa -- comparing scripture with scripture. Other plausible questions would be: Did Cush ever return to his father's (Ham) region in Africa? And or, Did Cush's sons or their children ever return or visit their grandfather Ham in Africa? I am not disputing the birthplace of Cush, we agree it was most likely in Africa where Ham lived. I am simply further explaining where Chush later took up residence after his marriage with Simiramis and childeren Havilah and Raamah lived. It certainly does agree with the scriptures. In fact not only do we know that Nimrod was king of Shinar there but also Cush's other sons Havilah, Raamah were also in the region. We also know that Simiramis, Cush's wife was from Mesopotamia. Likewise the reference to Cushan-Rishathaim King of Mesopotamia confirms this. The unanswered questions are: Did Cush have other marriages and other children in Africa? And the answer to these are that they are certainly plausible. Thanks Map Author. However, your submission does not agree with the scriptures, and other historical accounts. Speculating that Cush went to meet his wife Semiramis in the East has no foundation whatsoever. If Nimrod was a great hunter, then to leave Africa to Shinar was no difficult task for him. He didn't have to be born there. Cush in the Bible signifies South of Egypt. All the passages in the Bible refers to this. The Cushites in the Bible are Africans. All of the evidences presented for Eden's location are primarily taken from Torah and some form Tanakh with the historical observations using the homiletics, hermeneutic and exegesis methods. @ Anonymous comment regarding Islam. Unfortunately this is not the place or article to discuss or debate Islam, it's just not the forum for that topic. Thank you for your interest and I do appreciate your comments though. Yes in the natural sense God is God of all; however, as a Christian, I would have to point out that Mohamed did not die for the sins of mankind, only Jesus Christ died on the Cross for mankind, so I would encourage you to continue reading the Torah, even the Tanakh, and the New Testament. In my article I explain the question of Cush as follows... "Wasn’t Cush in Africa? It should be noted that the "land of Cush" or "latter Cush" in Genesis 2:13 was more likely named post-flood after the son of Ham. It then was used as a reference in writing Genesis 2:13 as to where the Gihon was. Ham, according to the Table of Nations in the Book of Genesis, was a son of Noah and the father of Cush. It is true that Cush’s father Ham lived in the region of lower Egypt "old Kush" at which time the region of Kush may have derived it’s name. However, Cush (son of Ham) must have then relocated to the Mesopotamia region (where his wife Semiramis was from) and bore his son Nimrod who became King of Shinar (in Mesopotamia). Furthermore, Judges 3:8,10 reference the "Cushan-Rishathaim King of Mesopotamia". The Shinar, Babylonian/Assyrian regions are much closer to the proposed Gihon River. So it is plausible that there was a second region referred to as Cush (latter) located where the proposed Gihon River was, and as referenced in Genesis 2:13 or what became Elam. It’s also plausible that Cush wanted to return to the Garden region that led him to re-settle at the Gihon river. 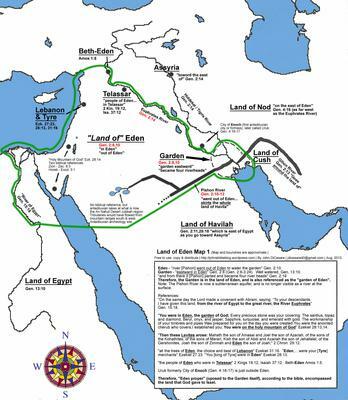 The adjacent known name locations of Cush’s sons settled in Persian Gulf and Arabia Genesis 10:7 (i.e. Nimrod, Havilah, Raamah) likewise reflect the more easterly region in which Cush himself took up residence later in life." Sorry Linda the response was from me the map author, not anonymous. Thank you Linda for your comment. I viewed Dr. Grady McMurtry's video and like it very much. I would agree that his theory is biblical, and would like to add that as he describes that it began in Israel, it most likely also increased in intensity as it progressed around the world leaving me with the hypothesis that it began "relatively" calm so as to lift the ark and not destroy it; likewise, allowing for least land damage to the typography and megalithic remains in the Eden region where the cleaving began, thus enabling Noah and his family to re-identify the Euphrates and the like. The Bible is very clear, as I described in my article, where Eden was and it is never wrong. If you allow scripture to interpret scripture, Cush is in Africa and not in Asia. Ham and his four sons settled in Africa and pasts of what is today Middle East. Egypt was known as the Land of Ham. Cush settled South of his brother Mizraim (Egypt). He never went to live in Sumeria or Shinar after the scattering. It was his last son, Nimrod, who lived in Shinar, and who might have attracted the Cushites there. When the Bible refers to Cush, it refer to Africa. Eden is actually Eastward standing in Africa. The Garden of Eden is located Eastward in Eden." And the LORD God planted a garden eastward in Eden; and there he put the man whom he had formed." Gen 2:8.
" And a river went out of Eden to water the garden; and from thence it was parted, and became into four heads. The only place where a river passes through all the land is , in this case, Cush/Ethiopia. This is in Africa where the Nile passes through the Cushitic lands. This might explain why it is difficult to pinpoint the exact location of Eden - before the Great Flood the land which formed the earth was all in one mass but after the Great Flood it got broken up. This is what we see today the broken mass of land! "To your descendants I have given this land, from the river of Egypt to the great river, the River Euphrates", and "Also I give to you and your descendants after you the land in which you are a stranger, all the land of Canaan, as an everlasting possession; and I will be their God." (See also: Exod. 6:8, 23:31 & Deut. 1:8). It was Israeli people that held to the Torah and passed it down, not the Ishmaelites.